We were all excited to see game 1 of the ALDS between the Detroit Tigers and New York Yankees for a showdown between two of the best pitchers in baseball, Justin Verlander and CC Sabathia. However with the scored tied at one apiece as the Yankees were about to come up to bat in the bottom in second, rain came down. 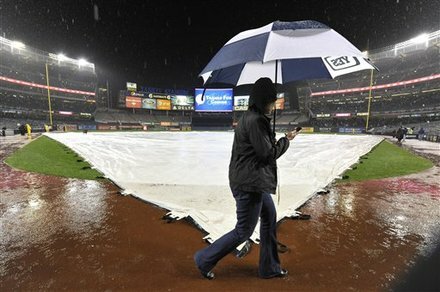 What was thought to be a passing storm turned into a non-stop rain, forcing Major League Baseball to postpone the conclusion of game 1 to be concluded on Saturday with Game 2 pushed back to Sunday. There will be no off day between games 2 and 3. So here is what the schedule looks like. September 3: Game 3 from Detroit. First pitched scheduled for 8:37 on TBS. There is potential for rain on Saturday night, no word on what could potentially happen if the conclusion to Game 2 be postponed further due to rain.